This is going to be one for the ages, check out the link...After numerous lackluster collaborations (Anna Sui, anyone? ), Rodarte's line looks like a keeper. The tulle overlay dress! The tights! The sheer yellow cardigan! Seriously, everything looks amazing, and if the quality is up there too, I don't doubt I'll own several of the peices. 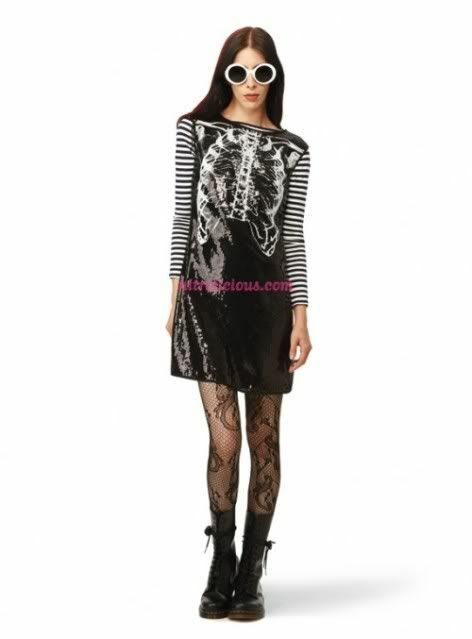 I hope I can get my hands on this sequined ribcage dress, thus fufilling my recent need for sequins. Said sequin lust has yet to be satisfied, it's sad really.